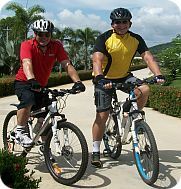 The area around our luxurious villa is ideal for cycling, one of the best ways to explore the beautiful scenery of Thailand. On the beach road of Pranburi, there are a number of outlets renting out bicycles for around 100 baht per day. Or, if you would prefer, we can arrange for bikes to be at the villa. For inspiration on cycle routes around the area you can explore this bikemap or try these suggestions of popular cycling routes around this beautiful area of Thailand. 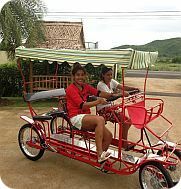 If you prefer a guided, more structured approach Hua Hin Bike Tours offer guided tours every day of the week. After an energetic day of cycling relax by the villa's 12-metre pool and enjoy the beautiful surroundings in the spa area. Why not treat yourself by booking in an in-villa massage.